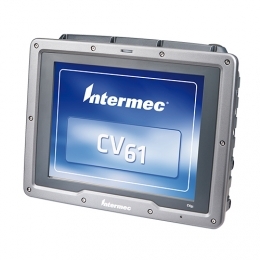 The CV61 computer terminal from Honeywell was specially developed for vehicle mounting. It masters current and future challenges with ease. You realize flexible hardware and software expansions with the CV61 effortlessly. Equipped with a powerful Intel Atom processor with 1.8 GHz and up to 3 GB RAM, the CV61 offers a reliable base for every computer system and demanding applications. Users increase their efficiency with the help of contactless voice control and complete wireless connectivity via Bluetooth and n-standard Wi-Fi.